Earlier, Root Canal Treatment (RCT/ Endodontic Treatments) used to be very cumbersome, and patients used to dread getting it done, added to it the number of visits! Things have changed a lot these days. A patient requiring an Root Canal Treatment generally will experience pain in a tooth while biting or lying down or at times may notice pus draining from a boil on the gum next to the teeth. Many times RCT is required for teeth fractured due to trauma or biting something hard. Intentional RCT is often done on teeth involved in prosthetic rehabilitation or severe attrition. The clinic has also successfully treated avulsed (out of socket due to trauma) teeth with endodontic therapy and replantation/ splinting. One of the leading Endodontist in Pune with tremendous experience generally do single visit root canal treatment in this clinic. This saves multiple visits of patients. They also have a full-time Endodontist who can visit any of the branches as per the patient's convenience. Right from Apex locators, Pro-Taper files, Rotary Handpieces to RVG's, the clinic is equipped with the latest equipment necessary for carrying out efficient Root Canal Treatments in Pune. 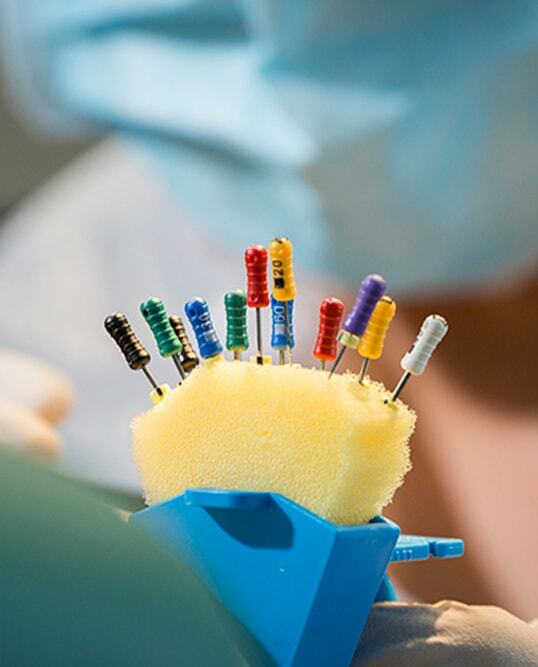 Being a very technique sensitive procedure, the use of the best of materials and providing the utmost care and detailed attention has ensured a very high success rate in Endodontic therapy in this clinic. Complex procedures like Apicoectomy are also carried out here. The clinic has successfully done many root canal treatment in Pune. Post and Core treatment of teeth broken at the neck is frequently done here. Patients are generally advised to go for crowns over the root canal treated teeth, to prevent fracture of the tooth structure. Treatment of Endo-Perio lesions, Apexification/ Apexogenesis with Calcium Hydroxide is also successfully done here. The clinic is famous for providing the best root canal treatment in Pune and carrying out multiple single visit root canals in a day for patients having limited time as in cases of dental tourism or as a part of implant procedures.